We’ve been having a heat wave in San Francisco ever since arriving home from Peru and it has made us want to spend all our time outdoors, although that might be because we’ve been melting in our apartment. So this past weekend we did just that- rode bikes to the GG Bridge and took long walks around the neighborhood, soaking up our Indian Summer. We stopped by the new Smitten off Fillmore and waited in line for their heavenly made to order ice cream. It’s hands down the best ice cream in San Francisco and hits the perfect sweet spot on a hot afternoon. I recently added these kate spade new york “Carima Flats” to my current shoe line-up and brought them with me to NYFW. In the past, I’ve tried to survive in heels running around New York, but I mostly packed flats and loafers for this trip and I know my feet will thank me. I’ve never been one to abide by the silly “No White After Labor Day” rule. In fact, I recently pulled back out some of my favorite white pieces to the front of my closet including this old Topshop scalloped skirt. A simple mix of chambray, white and tan is combination I’ll never tire of. Nice outfit! Love the flats and also the shirt. Beautiful pictures, as always. This outfit is so pretty and preppy! Love the beautiful coloured houses too! I like so much this shoes. Absolutely lovely. I love this laid-back, preppy style, Julia! This is such a classic and feminine outfit. I am in love with the scalloped edge skirt and how you paired it with a simple light blue shirt. Lovely outfit. such a perfect white and light blue look. I have the new white skirt line from yours and totally love it. enjoy your time in NY hope to see you dring LFW next week. Lovely outfit and your flat look super cute! Adorable look! Very classy and casual outfit! I like your shoes and shorts very much! I love your outfit! The scalloped skirt is so gorgeous!! Love this preppy, classic look! The scallops on the skirt are so adorable! Super cute casual look. Enjoy NYFW! That is such a cute scalloped skirt! Such a cute outfit! I’m obsessed with scallop hems! Such a clean and classic look! LOVE the scalloped skirt! Super cute! Loving the color palette of this outfit! Those are great flats! Such a lovely look! I always wear little bits of white after labour day as well! wearing white to get ice cream – brave! Love your new flats. So glad to hear someone will be wearing flats at NYFW. I think that is a smart move. Have fun! Great pics! 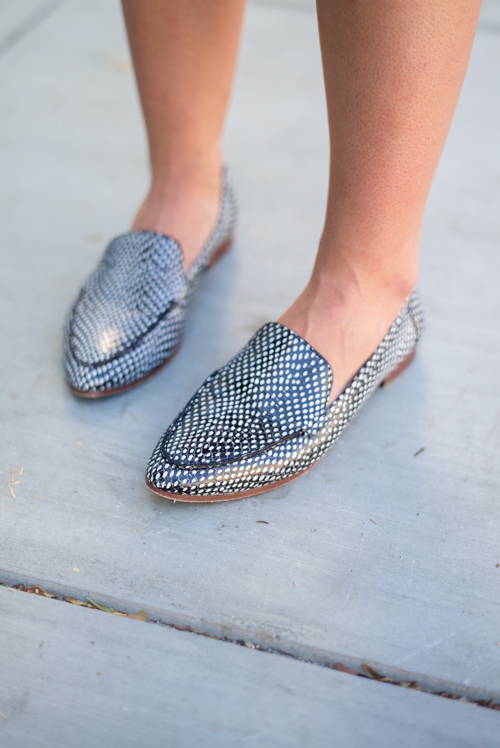 And love the shoes, they remind me of ol’ school snakeskin loafers! Agreed on the white after Labour day! What a silly rule. I’m a believer in wearing what makes you feel amazing, that way you’ll rock it no doubt. Also, how adorable are those little ice cream cone wrappers – sweet! Thanks for sharing lovely lady! Lovely look! I recently saw those flats in the store and thought about buying them too! Love them. Those flats are perfect for Fall! I love this skirt too! I just picked up a very similar one! These flats are SO CUTE! And I love how you styled them! This heat wave is killer! But I’m loving this outfit – so simple and chic and I’m really loving those loafers! That ice cream looks and sounds amazing! Love the shoes! love your loafers! perfectly accessorized outfit! It has been so hot here! I’m loving the late summer. Love that scalloped skirt! And white, tan and chambray is the perfect classic combo! I’m all about the loafer trend for fall. These are adorable! Beautiful flats! I love how they look with that skirt! Love the look but don’t quite get why you’d wear a sweater and a long sleeve top during a heat wave. Sandals and something sleeveless would’ve made more sense. Great look, I really love how you styled this! Those loafers are beautiful. These flats are amazing and I love the scalloped detail on your skirt! I love this look! The colour combination is so perfect for those hot Indian Summer days & the flats are gorgeous! In love with that outfit, amazing!! Killing it with the scalloped edge! I love this color combo too. It’s great to see you wearing flats so often, it’s practical and proof that outfits can be just as cute without the pain of heels! This look is such a great easy, casual look. I love the scallops! Aw yay, Smitten is my favorite! Love the detail on the skirt!! Love the scallops on that skirt! Beautiful outfit and pictures! I love this look. so clean and fresh looking. Those San Fran buildings are so adorable!! Love the hem on your little white skirt! I like this casual look very much! Those flats are really cute! Such a beautiful color inspiration, Julia – and those flats are so unique. Haven’t seen any similar to those actually! Adore this sweet casual look! The detail on the skirt is exceptional. You look stunning! I love your skirt! The scallops are so cute! Cute skirt, I love the scallop detail and it looks great paired with your chambray shirt. Such a gorgeous look! Absolutely love it!! Julia, I love your Blog and follow you religously, but I have to tell you that your post “what Im thinking about September 11–Hair Braids” was incredibly insesitive and inappropriate. 3,000 people lost their lives on Sept 11th. You really should have addressed that today and passed on Fashion/Hair for 1 day. I lived in Manhattan on Sept 11 2001. You have no idea what that day and the days that followed were like. Please think about this to the future. I have been seriously debating buying a jcrew monogram sweater. I think this post just convinced me. That bag is so pretty! I like Fendi!